Ahsoka Tano was introduced to the Star Wars Universe in 2008 where she instantly became one of the shows most popular characters, defying all expectations and becoming a voice for fans across the globe. The Togrutan went from being the padawan of Anakin Skywalker to leaving the Jedi order and renouncing her ties to the order in order to follow her own path after becoming confused and disconnected to the order. In 2014, Star Wars Rebels hit TV screens and fans were thrilled to see several appearances from Ahsoka, or as she is now known ‘Fulcrum’ an agent now working for the Rebel Alliance. What fans wanted to know next was, what happened to her in between the events of The Clone Wars and Rebels? E.K Johnston’s book Ahsoka answers this question. Star Wars fans were itching for more of Ahsoka after the sudden end of the Clone Wars, given that Lucasfilm had a huge amount of untold stories to tell, some made there way into this book. It definitely seems like a story for fans who are already familiar with the character, so if you aren’t familiar with Ahsoka, I would definitely encourage you to watch The Clone Wars and Rebels beforehand. The story is set a year after Order 66, the majority of clones are being replaced by stormtroopers, and Ahsoka has made the choice to live under the alias of “Ashla” working as a mechanic on the outer rim planet of Thabeska. She is later forced to leave Thabeska, resulting in Ahsoka travelling to the agricultural moon of Raada, a large producer of food to the galaxy. Raada’s food production gains attention from the Empire who need resources for their command of the galaxy, in particular a plant that will produce food quickly for the Empire. Unfortunately, the plant being looked for could prove to be detrimental to the planets soils as it’s extremely destructive. The Empire takes matters into their hands by employing a garrison on the planet in which they use to takeover the planets resources. As a result of the Empire’s actions, Ahsoka and her new group of friends team up to help prevent the takeover. This proves to be harder than Ahsoka would like as she struggles to contain the force, gaining attention from both the Empire and the Rebellion. Bail Organa takes a particular interest in Ahsoka and towards the end of the book, the pair discuss plans to build an intelligence network in which Ahsoka will lead under the name of Fulcrum. Ahsoka also gains interest from an Inquisitor known as the Sixth Brother, who has been sent to investigate Ahsoka as she has been identified as a force user. 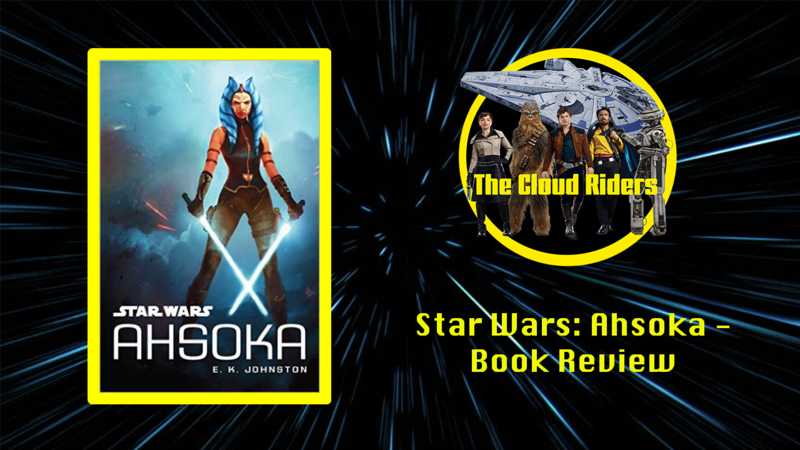 Ahsoka spends the majority of the story in survival mode, and readers explore the depths of this as well as understanding how she learnt to feel herself again and to have hope after suffering loss across the spectrum since leaving the Jedi Order. E.K Johnston must have felt a lot of pressure coming into this project, especially considering how popular Ahsoka is and how desperate fans are for more content surrounding the character. I can honestly say that she does not disappoint, not only continuing the story, but also expanding on it and taking fans deeper into Ahsoka’s story. The book delves into aspects of action, politics, friendship and drama with an emotional core that will make readers love the character even more than before. Thanks for your kinds words!